Chandigarh 15th April'2019: Let us visualise a scenario. An employer hires a person, and asks for the educational records, and other required documents before appointing. The person in question submits an affidavit claiming a graduate degree, and gets the job. A few years later, while renewing the contract, another such declaration is required, and the employee submits the declaration again. Only this time, the employer finds out, that the earlier declaration made by the employer, of being a graduate are false, and that person is a first-year drop-out. What do you think must have happened? Yes! You are right in thinking that the said employee’s services were terminated. At least that is what happens in a normal day-to-day scenario. But not in our political scenario. In our political scenario, a person who lies about educational qualifications while contesting for the highest sanctorum of democracy, the Parliament, is alleviated to the rank of a Union Minister. The above scenario matches what happened in the case of former HRD minister and present Textile Minister Smriti Zubin Irani. It was in the year 2004, that Smriti Irani, while submitting her nomination from Chandni Chowk in new Delhi, had claimed in her affidavit that she had done her Bachelor of Arts (BA) from Delhi University in 1996, via School of Open Learning (Correspondence). The problem here is not her education, but her later claims, and the questions on its authenticity. 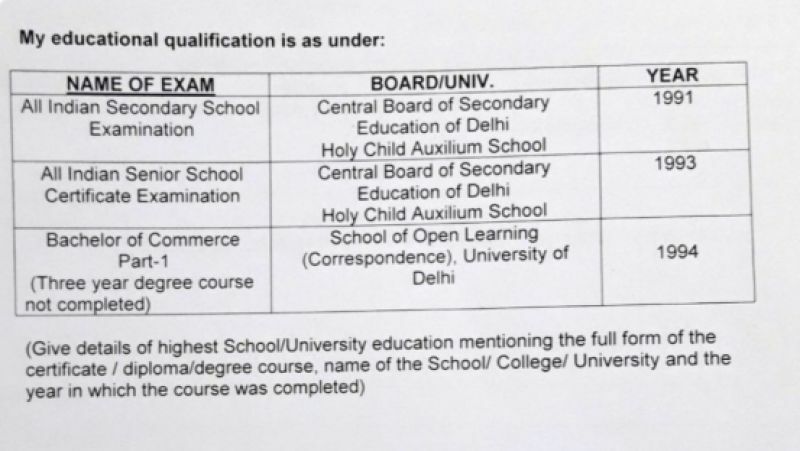 In 2011, while filing her nomination for Rajya Sabha from Gujrat, Smriti Irani claimed in her affidavit that her highest qualification was Bachelor of Commerce Part I, from Delhi University School of Open Learning. 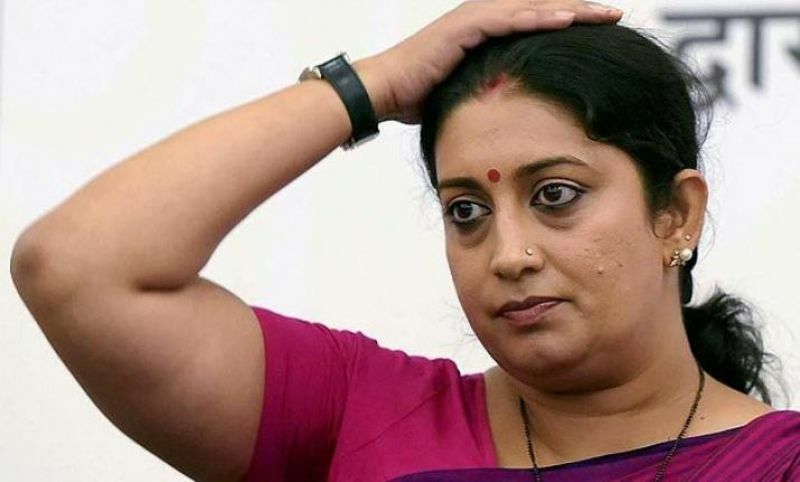 Her consequent affidavits submitted while filing nomination for Lok Sabha election 2019 from Amethi state a slightly different fact, where she states her qualification as “Bachelor of Commerce Part I (Three-year degree course not completed)” through the School of Open Learning (Correspondence), University of Delhi in 1994. Is her qualification complete or incomplete? At an event organised by India Today, The India Today Woman Summit in reply to a question asked by a journalist, about discrepancies in her affidavits submitted to EC, she vehemently claimed that she had a degree from Yale University which she could show all the people who call her ‘uneducated’ and shut them up. She said that Yale celebrated her leadership capacities in that degree. Yes, Smriti Irani is that employee of the People of India, who produced a fake affidavit while applying for her job at the Parliament. Even after so many disclosures, she continues to remain on the job. Given any other ‘normal’ scenario, this would not have been possible. But in the politics of our nation, anything and everything is possible. After submitting her conflicting affidavits, the conflicts which are highlighted are many. Is her qualification complete or incomplete? The minister has been asked this question on various occasions, but has very conveniently avoided answering. Has she studied Arts (according to her affidavit in 2004) or Commerce (according to her affidavits following 2011)? Smriti Irani and BJP have easily passed the buck on to other incidents of politicians lying about their qualifications. But the most important question is, is there any accountability and ownership of politicians playing around with the laws and rules? And an even bigger question is, can a person who has never been to a college, and has regularly lied about her qualification, be appointed as in-charge of an important ministry like Human Resource Development, which decides all policy matters on higher education in the nation. Her ability can be judged from the fact that she thinks a 6 day crash course in a foreign university is equal to a degree from the same. Can an employee of the People of India, who has lied her way through, stay on the job? Should the employer forgive an employee of such a blunder which is akin to a moral crime?